Souris Lions Cow Patty Bingo. 100 tickets at $50 each. Top prize of $2000. Each ticket represents a 10' X 10' square on the field. What ever square the cow patties in is the winner. Souris Lions Seniors Christmas Party: December 11,at the Souris Legion. This is a free event with live music, light lunch and a visit from Santa. Souris Lions Christmas Boxes: These are boxes given out to needy families just before Christmases. Each box contains everything needed for a full Turkey dinner as well as some other none perishable food items and Christmas gifts. 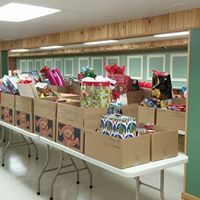 December 2015 say the Souris Lions Club put together and delivered over 120 Christmas Boxes as part of their annual Christmas tradition. Spearheaded by Lion Peter Boertien, and supported by local community groups and business, many volunteers came together to help make the event a great success. More photos may be seen by clicking HERE. Souris Lions Lotto 200 Draw. 200 Tickets sold in February for $100 tickets are sold. Every month there is a $500, 4 $100 and 4 $50 draw. The draws in March and December are for $1000 instead of $500. Souris Lions Canada Day Barbecue. Every Canada Day we have a Barbecue at the town celebration. We sell Hamburgers, Hotdogs, mussels. and pop. Souris Lions Voluntary Road Toll. First Saturday in August we set up a voluntary road toll on the beach causeway entering Souris. We just collect spare change or what ever they chose to donate. Souris Lions Community Gardens, This is a larg Garden Plot that the Lions Till every spring then mark off sections for people of our community to plant their garden's.